Place chocolate and butter in a microwave-safe bowl. Microwave it uncovered for 2 to 3 minutes (please be carful not to overhead and burn the chocolate), keep stirring it continuously until melted and smooth. Allow to cool for 5 minutes. Add the egg yolks and orange essence into the chocolate mixture. Beat egg whites and salt with a cake mixture until mixed well. Then add sugar. Fold the egg white into chocolate mixture. Pour the mixture into the small ramekins or any serving glasses of your choice. Cover them well with plastic wraps. Now let them stay in the freeze for more than 3 hrs to chill and set. When serving remove the plastic wrap and turn the ramekins onto a plate if you want the mousse on the plate. If serving Direct from the ramekins sprinkle some grated chocolate on top. 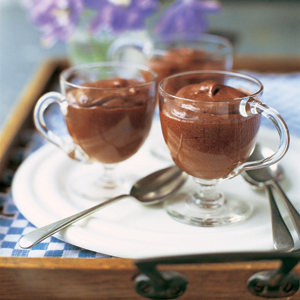 Sprinkle cocoa on the plate and on the mousse with some grated choco and your delicious recipe is ready for the go!